We, humans, are changing our planet drastically that scientists say the world entered a completely a new geological era called “Anthropocene”. But, it seems we are not shaping only the surface and the atmosphere of Earth, human activities are changing our near-space environment as well. The change is so big that NASA’s Van Allen probes have detected a human-made barrier surrounding Earth. Humans have long been shaping Earth’s landscape, but now scientists know we can shape our near-space environment as well. A certain type of communications – very low frequency, or VLF, radio communications – have been found to interact with particles in space, affecting how and where they move. At times, these interactions can create a barrier around Earth against natural high energy particle radiation in space. These results, part of a comprehensive paper on human-induced space weather, were recently published in Space Science Reviews. Music: Alternate and Parallel by Richard Birkin. This video is public domain and along with other supporting visualizations can be downloaded from the Scientific Visualization Studio. On August 30, 2012, NASA has launched two nearly identical spacecraft, called simply the Van Allen Probes, to understand what creates two gigantic donuts of radiation surrounding Earth, called the Van Allen radiation belts Notes 1. 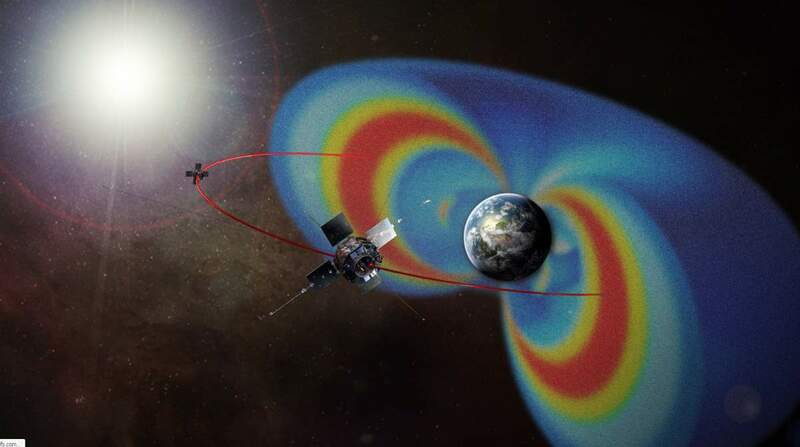 Formerly known as the Radiation Belt Storm Probes, these two probes were equipped by a device called Compact Relativistic Electron and Proton Telescope (CREPT) to measure energetic electrons and protons in Earth’s Van Allen Belts. CREPT measurements give scientists a better understanding of the physics of how the radiation belts lose electrons by a process known as electron microbursts. These probes have noticed an interesting formation: the charged particles which originate from the solar wind were being kept at bay by some kind of barrier created by “very low frequency”, or VLF, radio communicationsNotes 2. Further investigations revealed that that barrier actually pushing away the Van Allen Belts from the Earth over the past few decades. As a result, the lower limits of the Van Allen Belts are higher than they were in the 1960s. These results were recently published in Space Science Reviews. During the World War 1, the British Royal Navy made some experiments and realized that the very low-frequency Eradio transmissions could penetrate seawater to a limited depth. After the war, the United States military began use of VLF. VLF transmitters were later established in the late 1940s and 1950s for submarine communications and time signals. Since then, year after year, the VLF radio communications became more and more common, that they can influence the energetic charged particles around Earth – how and where they move. NASA’s Van Allen Probes Spot Human-Made Barrier Shrouding Earth. A certain type of communications — very low frequency, or VLF, radio communications — have been found to interact with particles in space, affecting how and where they move. At times, these interactions can create a barrier around Earth against natural high energy particle radiation in space. These results, part of a comprehensive paper on human-induced space weather, were recently published in Space Science Reviews. So, we, humans, started to change the “space weather”. Not only the surface of Earth and its atmosphere, but also the space around us is “anthropogenic” now. A radiation belt is a zone of energetic charged particles around a planet. Most of these particles originate from the solar wind that is captured by and held around a planet by that planet’s magnetic field. Two such belts around Earth were discovered in 1958. The discovery of the belts is credited to James Alfred Van Allen (September 7, 1914 – August 9, 2006) the American space scientist who led the scientific community for the inclusion of scientific research instruments on space satellites. Hence, the Earth’s belts are known as the Van Allen belts.The inner belt, stretching from about 1,000 to 8,000 miles (1,600 to 12,800 km) above Earth’s surface, is fairly stable. However, the outer ring, spanning 12,000 to 25,000 miles (19,000 to 40,000 km), can swell up to 100 times its usual size during solar storms, engulfing communications and research satellites, bathing them in harmful radiation. Very low frequency or VLF is the ITU designation for radio frequencies (RF) in the range of 3 kHz to 30 kHz and corresponding wavelengths from 100 to 10 kilometers, respectively. Due to its limited bandwidth, audio (voice) transmission is highly impractical in this band, and therefore only low data rate coded signals are used. The VLF band is used for a few radio navigation services, government time radio stations (broadcasting time signals to set radio clocks) and for secure military communication. Since VLF waves can penetrate at least 40 meters (120 ft) into saltwater, they are used for military communication with submarines.